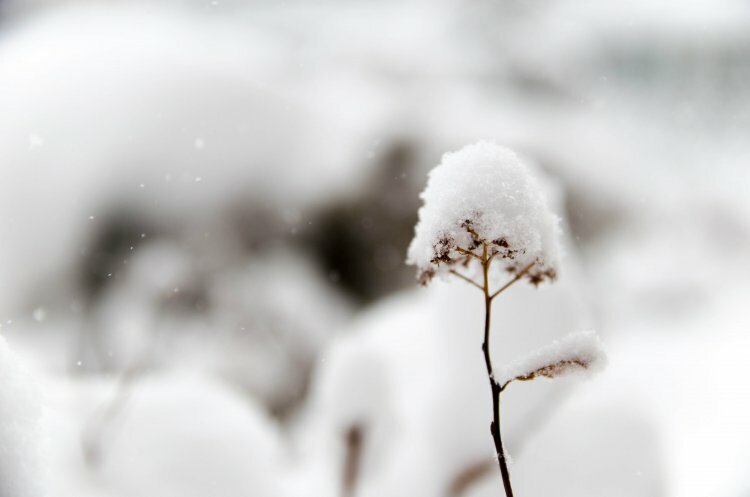 Flowers that bloom in winter are not only aesthetically magnificent, but they are also admirably resilient for being able to withstand harsh temperatures. These winter flowers might look delicate, but they have grit. After all, not all plants are suited for frigid temperatures. Some of these are even great as hanging basket plants. It’s not a rare misconception to think that delicate little flowers mostly die in the winter season, especially when it snows. However; the only thing that happens to the cool flowers that survive the winter is that their respiration and photosynthesis slows and their growth halts. Sometimes maybe leaves fall off, but they don’t die just from that alone. Let’s look at some cool flowers that bloom in winter. Its common name is just “Box”, but it has 3 botanical names. These are Buxus Harlandii, Buxus Sempervirens, and Buxus Microphylla. It can be considered a shrub or a hedge and the best time to plant it is in spring or autumn. 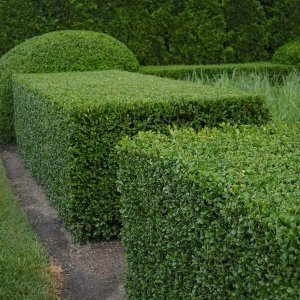 If you choose not to trim Buxus, they can grow to 16×16 feet. It’s it thrive in both shade and sun and Buxus is considered one of the easier plants to grow out there. They are also great for perennial hanging baskets should you be planning to go that route. Box (Buxus) is generally planted in gardens as a cut, formal plant or fence, even though there are numerous varieties around that are perfectly beautiful as well. While Box has always been Mr. Dependable in gardens, it is currently being currently observed that they are now having a hard time developing because of sickness and irritations from pests. These diseases can also deface their slick appearance. When choosing the type of soil to provide for Box, you only need to make sure that it has adequate drainage flow and that the soil doesn’t totally dry out. Also, since it can handle deep shade, planting beneath taller trees is an acceptable and viable option. Organic matter like garden compost or rotted manure can assist in Buxus’ growth. Spread those over the area it occupies and fork it in. However, do note that you shouldn’t place the organic matter in the base or bottom of a planting trench or opening hole. 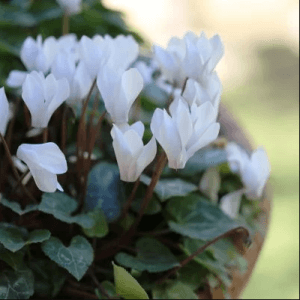 Cyclamen is its botanical name, while it is more commonly known as the “Sow Bread.” These are Tuberous perennial that mostly bloom in winter and autumn. Hence; it is best to plant them in autumn, early spring, and winter, but only when the ground is not frozen! Cyclamen plants grow to about 2-6×3-6 inches in height and spread. They like partial shade and are considered only moderately challenging to take care of. While most wouldn’t be able to handle the falling temperatures, Cyclamen is there to bloom, shine, and give out color to an otherwise dull environment. This is especially true during late winter and early spring. Robust Cyclamen species are perfect for prospering under trees. They also blend well when planted with other early-blooming forests plants such as the primroses, winter aconites, and snowdrops. If your garden isn’t either too dry or too sunny, it shouldn’t be too hard to raise Cyclamen. Plant tubers only about 1¼-2in deep; go any deeper and you’ll risk them not flowering. They love to be in a partly shaded area in a moderately fertile well-drained soil. 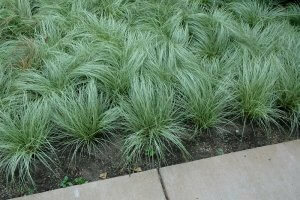 If you place this plant in an area which is frost-prone, giving it deep loose mulch such as bark chips will be ideal. Be wary of grey squirrels or mice if they are abundant in your area. These can cause trouble for hardy Cyclamen because these critters can dig up the tubers. Also, if you happen to be taking care of these plants under glass, such as a greenhouse, you must also watch out for vine weevils and the glasshouse red spider mite. There are a vast amount of different types of the Carex plant. Let’s go through a few of them so you can choose which one you’d like to incorporate into your collection. Also known as the “Dark Horse.” This one comes from the family Cyperaceae. They can either be evergreen or deciduous, tufted perennials or rhizomatous, and can have strap-shaped leaves or triangular stems. The Dark Horse is a clump-forming evergreen sedge that can grow to about 80cm tall. It is dense and has hair-like foliage. Do not be surprised if you see semi-trailing black flower spikes. They come out usually during the summer. Should you decide to grow these, know that the Dark Horse Carex grows best in moist but well-drained soil and in a sheltered, partly-shaded partly-sunny area. This type of Carex fits perfectly with our theme; it is even known as the “Frosted Curls.” Carex Comans is synonymous, and may even sometimes be confused with, Carex Fraseri, Carex Albula, and Carex Flagellifera. 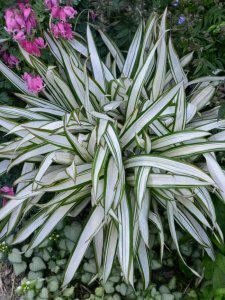 This evergreen perennial creates a slender mop-head of shining, shimmering, silver-green leaves. These aren’t hard to grow at all. As with most in this list, well-drained and fertile soils work wonders. Pro tip: just make sure to cut out dead leaves (if any) in the summer. There are still many more you can choose from apart from what is stated in this list. Some are the Viola (winter pansies), the Iris Reticulata, and the Erica Carnea (winter-flowering heathers). You can check those out as well! Whichever one you choose, make sure to stick with the theme. Also, it is vital to know beforehand what you can expect from these flowers when the falling temperatures come. This will save you from disappointments and dead plants. You can mix and match colors or merely fill your garden with a white color palette. It’s all up to you. Happy Gardening! Previous article Do Your Potted Plants Have Soil Mites And Should You Get Rid Of Them?